In 1966 a revealing history book was published, in which the author Dr Carol Quigley claimed, in essence, that international financial groups, exercising power through the creation of financial credit on an international scale, had worked closely * with Communists for the purpose of creating a New World Order. 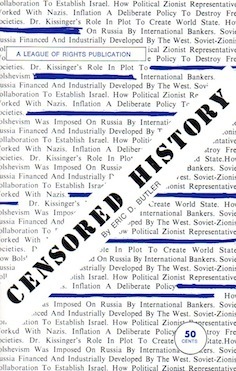 Eric D. Butler explains the reality of the conspiracy for imposing a World State, he shows how the Western technology paid for Soviet economic development, reveals the truth about the Russian Revolution, the financiers, the Soviet-Zionist collaboration. He talks at length about who are the Jews, the “anti -semitic” smear and the myth of the six million.